I've used your service at three dealerships and I recommend it to all of my peers. It is, by far, the best OFAC service I've seen! Thanks for helping me through the 'partial match' I had and showing me what to print and send to the bank. I was able to prove to the bank it was a false positive and they approved the deal. If I didn't have you guys to lean on I might have lost the deal. We've used your service for a few years and will never switch! You provide an easy service, understand the dealers and you're always there to answer questions. Thanks again! PatriotCheck is the revolutionary service for auto dealers brought to you by the industry experts at PatriotDealer.com. In this demonstration, you'll see how simple it is to move quickly through the OFAC compliance checkbox and get back to delivering the deal. PatriotCheck is a name-based search, so you can use it for cash or finance customersa definite advantage over the credit bureau service. PatriotCheck makes record keeping easy, too. With each search, you'll receive a confirmation for your records. We'll also store all searches for you as part of the required external audit trail. Why waste time with other offerings that are either unsupported, too expensive...or both? 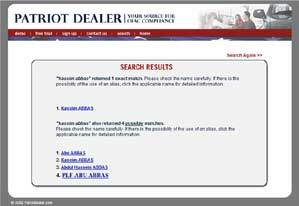 With PatriotDealer, you receive one bill for your annual subscriptionone that includes unlimited searches. We also offer group discounts for multiple locations under common ownership and our service is supported every day until Midnight (Eastern). You'll join a long list of satisfied customers who look to us as the first name in compliance. To show you how easy PatriotCheck is to use, we have created three typical search result scenarios. To see the system in action, just click on any name under each scenario. Scenario One: No match to the name you enter. The search result will indicate that there is no match in the database and will prompt you to print a "no match" verification that you can keep for your records. The searches are also stored so you can access and reprint a confirmation at any time. Scenario Two: An exact match to the name you enter. The search results page will confirm the match and will show you the reason the individual appears on the OFAC list. 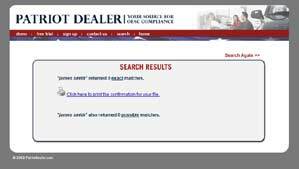 A successful search will also prompt you to complete the "rejected transaction" form. This is a form you are required to fill out and fax back to the Treasury Department. 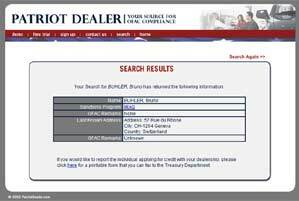 It indicates that there is a person on the OFAC list that has attempted to do business with you. Scenario Three: Multiple matches. Sometimes you will enter a name that will return multiple matches. This could be because the individual uses aliases, or because there are other similar names, or perhaps because you have incomplete information about the individual. If there are multiple matches, you are presented with an interim screen that lets you review additional information about the matched name. In the event of a close match, this is very useful information to provide the bank to prove the matched name is not your customer. PatriotCheck works the same way in real time, right in your dealership. In just a few seconds you can search, get verification and print records for your file. It's that easy to comply. Try it yourself with our free trial, contact us with any questions or sign up now to begin safeguarding your dealership today.